Lake Manuherikia existed in Central Otago around 16–18 million years ago. 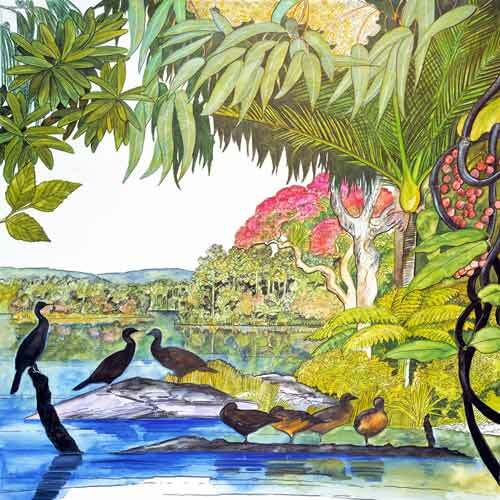 It was the home of water birds, fish, crocodilians and eucalyptus trees. The climate at the time was much warmer, almost tropical. A cooling of the global climate may have caused the demise of crocodilians and eucalyptus in New Zealand. Freshwater fossil deposits are relatively rare in New Zealand and terrestrial sedimentary rocks of the Manuherikia valley offer the possibility of finding other reptile and amphibian fossils not yet documented in this country.